Motorola today introduced its Moto G7 series of Android phones, and it confirmed that one of them will be making its way to T-Mobile. The Moto G7 Power will launch at T-Mobile and Metro by T-Mobile. Exact launch details and pricing for T-Mo and Metro aren’t yet available, but Motorola said today that the Moto G7 Power will begin rolling out in the U.S. this spring with a starting MSRP of $249. When it comes to specs, the highlight feature of the Moto G7 Power is its battery. Motorola has crammed a 5000mAh battery into this device, which it says will get you up to three days of battery life on a single charge. Thankfully, Motorola has also included 15W TurboPower fast charging support so that you can more quickly refill that 5000mAh battery when it does finally run out. Other features of the Moto G7 Power include a 6.2-inch with a resolution of 1570×720 and a notch that houses an 8MP camera. Around back there’s a 12MP camera with LED flash and a fingerprint reader below it. 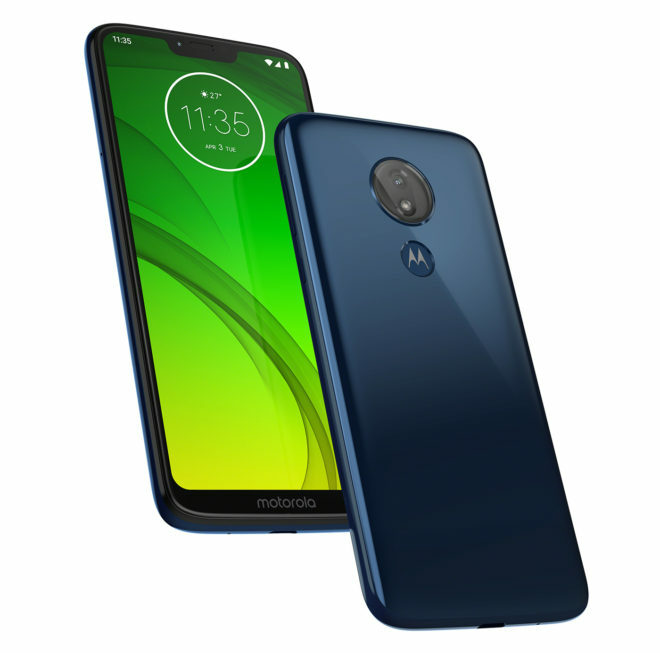 The body of the Moto G7 Power includes a water repellent coating, and inside of it is a 1.8GHz octa-core Snapdragon 632 processor, 3GB of RAM, 32GB of storage, and a microSD slot with support for cards up to 512GB. Rounding things out are USB-C and 3.5mm headphone ports, FM radio support, and Android 9 Pie. Motorola’s Moto G series of phones are regularly praised for being solid, affordable Android devices, so it’s good to see that one of the Moto G7 models will be making its way to T-Mobile and Metro. With its 5000mAh battery, the Moto G7 Power should be on your radar if battery life is a priority when you’re shopping for a new smartphone. Stay tuned for more launch info on the Moto G7 Power as it becomes available. Resolution is HORRENDOUS (please no arguments this helps battery last longer) 279ppi. So is 32gb storage…even 64 is not enough anymore. 403ppi on the G7 vs 294ppi on the G7 Play. Where did you get 279ppi? Looks like a decent phone for the price to me,& you’re right,just checked Moto’s site for the specs,the display is 403ppi. I’m not a fan of the notch,but,I can forgive it @ the price & it’s an improvement on the REVVL 2 line-up. Hoping it’ll be a JOD Device. For whatever reason tmo,will not get rid of those 2 horror shows of phones,have no idea why they won’t. I know I hate these mid-range phones because T-Mobile won’t put them on jod I don’t look for them to put this one on jod I hope they do. phone arena….there are several models you know…. Gotcha. While Tmo may or may not offer the others down the road, you don’t have to get the Power version and can chose the other non-anemic ppi displays. If lack of NFC is a dealbreaker then do look elsewhere. My dealbreaker is the lack of IP68 water and dust proofing. The phone isn’t for everyone. But for people who don’t care about 720p and/or NFC it is great. I may get one for my T-Mobile Digits line. $250 for a phone that will last the average user 2 days? Worth every penny to the guy who doesn’t want to be attached to a wall all day. I wish people would post suitable alternatives when they don’t recommend a certain product. For the same price you can get an LG Stylo 4, Samsung Galaxy j7 Star or a T-Moble REVVL 2 Plus. If resolution is that important then the Stylo and REVVL have 1080 screens instead of 720. Other than that, the Moto G7 Power has a bigger battery and has the newest version of Android. Personally I don’t see the point of having such high resolution on a screen small enough to fit in my pocket. I lived with 240 and 480 resolutions on my TV most of my life and never was bothered by it. THERE IS NO ALTERNATIVE! There are zero mid-price phones @ 6+”, 1080p or better, 64-128gb, NFC, Band 71. Even some flagships do not meet ALL these requirements. Regular Stylo 5 could compromise @ 1080p, 6″,64gb, NFC….even w/ fixed battery & no 600mhz. Removable battery? Dream on, my V20 was the last one I think years ago. Companies found out how to get you to upgrade, internal battery degradation. Yes. I guess it’s stick in pocket a couple of spare powered cases. Yeh, saw in the newer thread. Hope for Metro too. Most people are unable to notice pixels finer than 250ppi to 300ppi, depending on how far from your face you hold the phone. Anything with denser pixels is overkill IMO. Some reviews of the G7 Power with it’s 720p/279ppi display say it looks just as good as any 1080p phone. Personally I use my phone for reading and watching educational videos from a source that does’t offer anything over HD 720p. So I would not benefit from a denser screen anyway. I would really like the 64gb-drive 4gb-ram version though. I can live just fine with a 500gb SD card, but I’ve had problems in the past where certain apps wouldn’t work with or even recognize the SD card like they should and do on other devices. IfI this phone does that I’m taking it back for a refund. 3gb-ram should work for me. My laptop only has 2gb and it works just fine. But the more the merrier. I personally would want more like 400 as phones get larger and most important- for zooming in when something is too small in say, a PDF / picture. I’d prefer 128gb storage. For sure 64 not enough, but will have to do for nowmuch better than 32. Yes, installing to SD is not a fix all- the few apps that allow this may only accept their cachedownloads back in internal. Others- their automatic update moves them back to internal. Memory is like the frog in the pot of cold water slowly being heated-things unnoticeably slow to a crawl… then when we do notice, we blame something else for it… because of accompanying app shutdownsdevice reboots. On Windows i run browser with many, many tabs open plus multitask several finance programs and other legacy software on virtual boxes desktops… when possible attach extra monitor. I can do it all on a 232gb tablet(save for the virtuals and extra monitor on this one), a 4(upgraded to 8)128gb aio tablet, a 8(upgraded to 16)256gb aio tablet, and a 16(upgraded to 32)512+separate video ram laptop. The difference is so noticeable between categories and upgrades that it’s not funny. Queriesapps run instantly, ditto for entire web pages loading, freezesrestartsdark, blank screens gradually disappear. Windows Ram sweetpoint imho “starts” at 8+separate vram(useful even if not using dual monitors) or 16gb. The screen resolution bothers me, but at ~$250 this is a lot of device for the money. I’m pretty tempted by it. at that resolution… might be able to see more stuff on the smaller moto. I like everything about it,until I read it only has 32 gigs,and only 3 gigs of ram. All phone should have 4 gigs of ram 64 gigs memory at least in this day and age. The entire rest of the globe gets a 64GB 4 gigabyte memory phone in fact you can buy the International one from Australia for $225 although it won’t work properly on T-Mobile. I hate the way they treat u.s. customers as less than desirable and rip us off on the specs on this phone. It’ll have band 71 the Moto 5e plus does my wife has the phone gets great reception basically the same phone with a few new updates. The spec sheets for the Moto G7 Power say it has band 71. The US version does have band 71 and nfc. However they rip us off by giving us a 3gb memory 32GB Storage phone when the rest of the globe gets 4 gigabyte memory and 64GB of storage. TMobile I despise the way you treat United States citizens giving us a crap phone with inferior specs. Looks like the USA (all carriers) got only the 32GB/3GB-RAM version. So it’s not just a T-Mobile spec. Any idea when this phone will be released for T-Mobile? I see I can get the unlocked version and get either a $50 or $100 discount if I buy it from BestBuy and activate it for Verison, AT&T or Sprint. But no discounts for T-Mobile nor is it even in the T-Mobile store yet. Seems like T-Mobile is lagging behind. Oh well. Patience is a virtue. Maybe this will give me time to see more reviews before committing to this phone. Still only a S632 or barely better than the G6 if at all. I was hoping for at at least a 660 or 7xx. I tried a G6 and similar phones to this, and they struggle with simple Google Maps. I know it is budget, but I still expected more.